Dining out with a baby can be a pretty stressful event! There’s a lot of extra things you need to pack, as well as the worry they will go into a full-blown meltdown in the restaurant, forcing you to leave. It can be daunting and stressful. However, the good news is, there are ways to ensure you have a calm and enjoyable time. 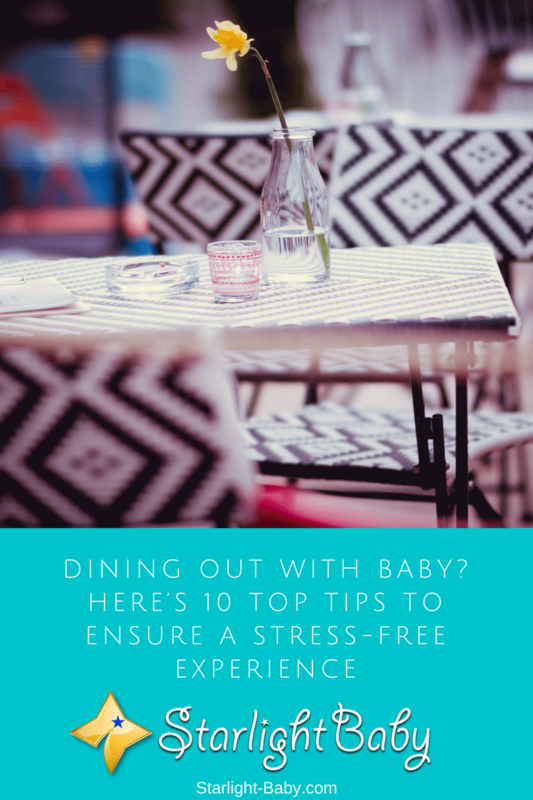 Here, you’ll discover 10 top tips to ensure a stress-free experience when dining out with baby. When deciding where to go, you’re going to want to ensure you’re choosing a child-friendly restaurant. This doesn’t mean the establishment needs to be centered around kids, but it does mean they should at least have young children in mind. Do your research and see what family-friendly facilities the restaurant has. Will there be changing tables in the bathroom? Do they have high chairs for baby? These simple things will make a huge difference to your dining out experience. You’ll also want to look out for reviews from other parents to see what type of experience you’re likely to have. Child-friendly restaurants are also more likely to be understanding if your baby does begin to cry. So, save the fancy, elegant dining experience for when you have a babysitter. Once you’ve found a baby-friendly restaurant, it’s a good idea to book a reservation. That way, you know 100% there will be a table ready for you when you arrive. If you were to simply turn up without booking, you could end up waiting for a table and then waiting again to get served. The longer you’re waiting, the fussier baby is likely to become. Reservations can eliminate a lot of potential stress from your dining experience, so this is something you’re going to want to start doing every time you eat out with baby. If you really want a stress-free dining experience with baby, it’s best to go out during off-peak times. Lunch time and evenings tend to be the busiest times for restaurants. So, consider booking mid-afternoon. Of course, busy periods will differ depending upon the restaurant. So, you’ll definitely want to research the particular restaurant you’re hoping to head to, in order to see which times they tend to be busiest. Distraction is often the best tool you can use to prevent baby meltdowns. Remember, your little one doesn’t have a very big attention span. Therefore, it’s highly likely they’re going to get fussy at some point. Toys can help you to distract their attention, potentially preventing a meltdown altogether. You don’t need to take a huge selection of toys, just 1-3 toys will do. Aim to take at least their favorite toy and a book. You’ll also want to make sure the toys you do take, aren’t overly noisy. If your baby is due a feed, make sure you do it before ordering food for yourself. That way, there’s a chance they may actually fall asleep while you enjoy your meal. If baby is eating solid foods, take some snacks with you just in case the food order takes longer than expected. The last thing you need when you’re sitting down to eat with baby in toe, is to discover you’ve left your essentials at home. Always ensure you’ve got a well-stocked diaper bag with you. This should include extra diapers, baby wipes, a change of clothing for baby and extra milk if you’re bottle feeding. Even if you think you won’t need something, it’s better to pack it just in case. After all, it’s better to be over-prepared than underprepared! Before baby came along, you likely enjoyed your meals out. You could leisurely sit down for an hour or two, enjoying the different surroundings. However, dining out with baby is a very different experience. The longer you’re out at the restaurant, the more likely it is that baby will become fussy. So, you’ll want to make sure you don’t stay out too long. Head out to the restaurant as close to your booking time as possible and look out for signs your baby has had enough while you’re there. This may sound like an unnecessary tip, but even if you’ve checked a restaurant is child-friendly, it doesn’t mean there will automatically be enough space to park up a stroller. Therefore, you’ll want to go into the restaurant before booking, just to see how much space is available between the tables. So why does stroller space matter? Well, imagine you turn up at the restaurant and your baby is fast asleep in their stroller. Rather than wake them up, the easiest and less stressful option would be to leave them sleeping in the stroller while you order and eat your meal. If there isn’t enough space, you obviously won’t have the option to leave baby there. This would most likely result in your little one having an epic meltdown when they’re woken up! If your baby is weaning onto solid foods, you’ll want to take plenty of snacks with you. There could be a long wait for food, even if you do order baby’s food first. They also may finish eating before you do. So, it’s good to have a selection of healthy snacks they can enjoy while you finish up your meal. You’ve done it, you’ve gotten through an entire meal. Now, pay the bill! Ideally, you’ll want to ask for the bill before you’ve even finished eating your meal. Some restaurants can be notoriously slow for bringing the bill, so asking to settle it as soon as possible is a good idea. The last thing you want to do when you’ve enjoyed a nice meal out with baby, is hang around to make payment. So, take care of the bill quickly and head straight home! Overall, eating out with baby can be stressful, but the tips above can help to make it a more enjoyable experience. Above all else, don’t forget to actually enjoy your meal out. Even if baby does cry, if you’ve gone to a family friendly restaurant, it really won’t matter. Babies cry, and most people are understanding of this. So, don’t sweat it, try the above tips and relax! Taking toys, extra diapers, snacks, choosing a children friendly restaurant, and not staying out too long are what I buy into completely because it’s certainly going to ensure that you have a wonderful seat out with both the baby and yourself having a comfortable time together. Haha, laughing at that expression – “Head out before disaster strikes”. Babies are just too sensitive, the tiniest of thing throws them into a state of confusion and they would only respond by fussing or crying out loud. Yes, babies could be sensitive at times. They could cry without a warning due to things that seem innocent to adults, haha. About a month ago, when we were planning to celebrate our wedding anniversary by dining out, my wife and I debated on whether to take the baby out or not. My wife was in favor and I suggested we leave the baby with my mother. The baby was 9 months and my argument was dining ours was neither pleasing to the baby nor for us. IN a month, I will be celebrating my birthday, however, we have already made a plans to take the baby out this time. I will be almost one year and we believe going out will be a pleasure for him as well. Parents do know their baby’s personality so it is just right to leave him in the care of a nanny or relative if you feel he/she will not be able to adapt to the environment. Now that your baby is older, I do think he/she would welcome the change of atmosphere and would love to be out there somewhere with both of you. Best of luck! Right now i really don’t go out with my last baby, he is one. It is so stressful that i had to get a nanny anytime i want to go out with my hubby or alone , not just a resturant . However reading this is very helpful. Will try out some tips next time. We’re so glad these tips could help ease your stress and worries about going out with your baby. We would love to hear about your experience when you do go out with him/her. We wish you the best of luck! Ensuring that we dine at baby friendly restaurants is the best way that we can get to handle everything that can come up as we enjoy those moments with the baby. This is the reason I always advise my friends to be mindful of where they set out to eat to avoid having to do it in a place where they will be embarrassed. That’s a very good suggestion that you gave to your friend, there are some venue that aren’t conducive to have a baby in because at times, pollution and unexpected violence might occur and the child’s safety might be in jeopardy. It’s also very important not to stay out too long as long as you are going out with your baby. That is what I was saying in the sense that not all restaurants will feel cool with some parents coming with their babies to eat at their place. So, ensuring that we eat at restaurants that accommodates parents that come with their baby to eat and feel some good time. Yes, that is correct. After all, families go on nights out for dinner and other bonding activities so they can relax and have a good time. So a child-friendly restaurant is a must! Otherwise, the purpose of going out gets defeated. You are totally correct on the need for a family that is going out on a dinner night to pick a restaurant that is baby friendly in the sense that once that is not achieved, you won’t feel comfortable enjoying the good moments while the baby is sad and unhappy.